Getting dressed for the winter doesn’t have to only be about bundling up to keep the cold away. We have a style rule we’re sticking to this season: Every cold weather garment we scoop up has to be as beautiful as it is warm and easy to mix in with the rest of our wardrobe. 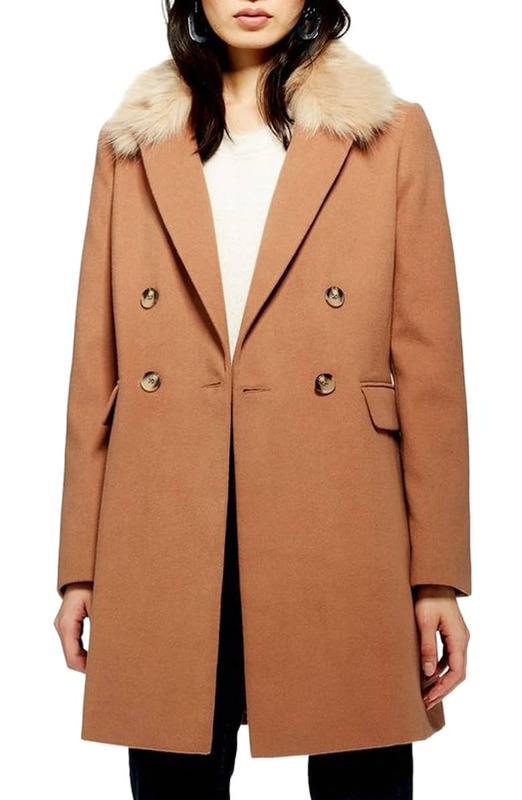 An outerwear design we have to add to our collections is this Topshop Naomi Faux Fur Collar Coat. The topper features a double-breasted button closure, a faux fur shawl collar, long sleeves with three-button cuffs and front flap pockets. The faux fur collar is actually removable so we get to enjoy the extra dose of glam. Depending on our desired look for the day, we can also take it off and go the simple route. See it: Snag the Topshop Naomi Faux Fur Collar Coat (marked down 40 percent off its original $98 price, now $58) while select colors and sizes are still in stock! For more great marked down coats, check out the outerwear deals at Nordstrom. This Topshop Naomi Faux Fur Collar Coat coat can be worn over jeans and a sweater or a long sleeve top for a relaxed daytime look. We can also step out with this same design topped over a fit-and-flare dress with sparkly heels for a holiday party ensemble. The design comes in three colors including black, camel and blush pink. While the classic black color looks beautiful, we also love the camel version of the coat. This lighter tan shade makes for a stylish alternative. We would layer this version on top of a white or beige sweater dress and step out in matching ankle boots or our favorite going out heels. We love playful pastel and it is impossible not to fall for this a double-breasted coat in soft Blush (light pink). There is so much fun to be had with this design! We can slip it on over an all-white outfit or wear it over a mix of nudes. Anytime we prefer not to risk it wearing all white, we could go with all grey underneath instead. The coat will also look great paired with a long sleeve T-shirt, cozy joggers and matching pale pink sneakers. Imagine how gorgeous the Topshop Naomi Faux Fur Collar Coat would look worn with a sparkly sequin dress and heels for New Year’s festivities? Shoppers who bought this coat seemed most impressed by how beautiful it looks in person and how soft and comfortable the fabric feels to wear. They also appreciated that the collar is removable, giving them two looks in one coat. Reviewers mentioned they received lots of compliments whenever they wore the coat out. Most shoppers bought this coat for themselves with the most popular colors mentioned being black and pink. Some even bought this design in more than one shade! Anyone who loves this design but would prefer an alternative might love the Leith Oversized Double Breasted Coat in a slightly looser silhouette. The coat is also on sale and comes in three color choices including Green Bug, Purple Fragrant and tan. 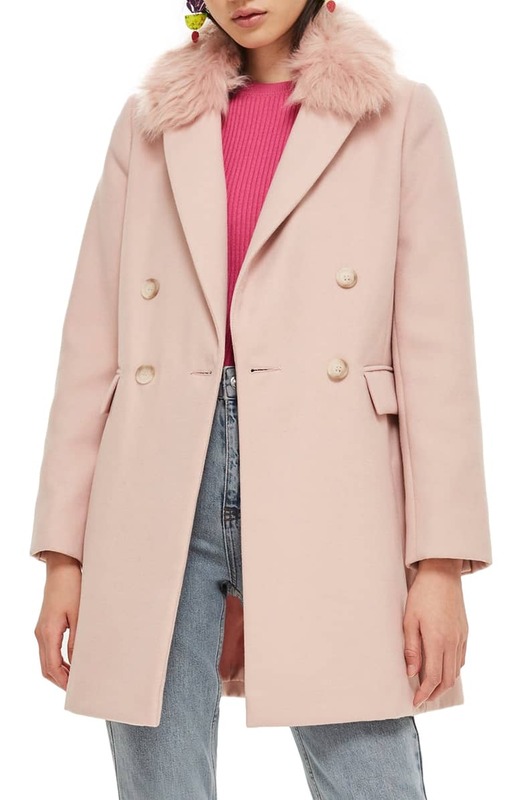 See it: Grab the Leith Oversized Double Breasted Coat (marked down to 40 percent off its original $89, now $53) at Nordstrom while select sizes and colors are in stock. Sizes range from XXS to extra large and are available based on color. 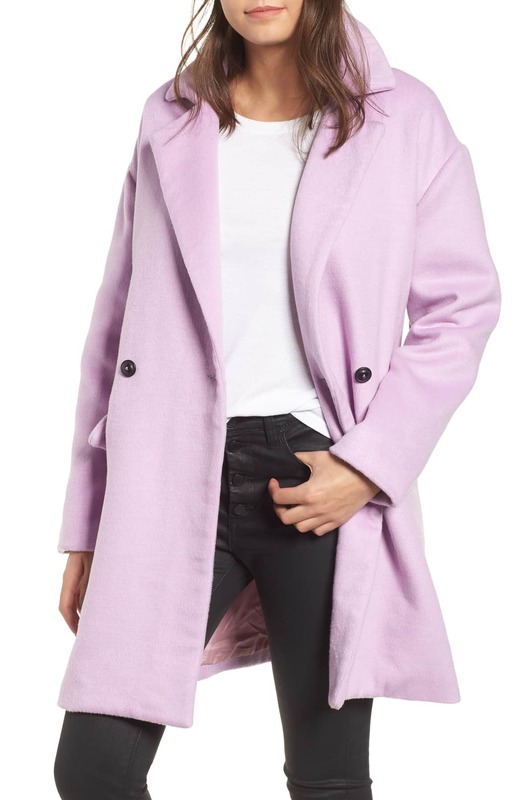 Shoppers who love pastels and have already snagged a pink coat for the season can grab the Leith Oversized Double Breasted Coat in this lilac shade. We also love that the coat is available in the Green Bug shade since we can go with a bold color without going too bright. 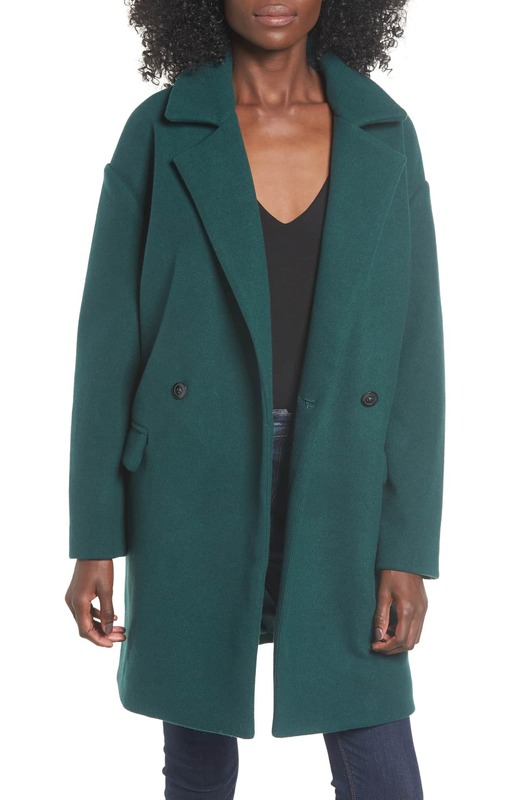 We can always wear most outerwear picks with jeans but the coat in this jewel tone would look really great paired with velvet leggings tucked into over-the-knee boots topped by an oversized knit shirt. See it: Snag the Topshop Naomi Faux Fur Collar Coat (marked down 40 percent off its original $98 price, now $58) while select colors and sizes are still in stock! Prefer an alternate? 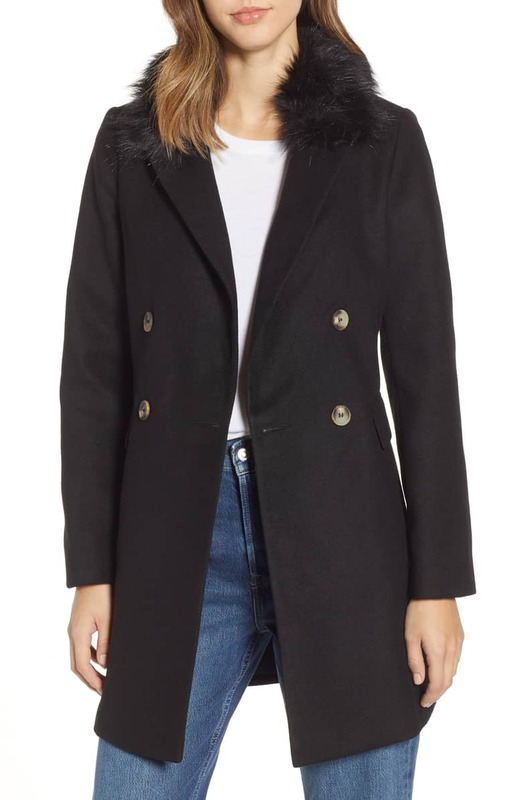 Try this similar Leith Oversized Double Breasted Coat (marked down to 40 percent off its original $89, now $53) while select sizes and colors are in stock. For more great marked down coats, check out the outerwear deals at Nordstrom. Our layered looks just got more fabulous and varied with these colorful picks.